Impress the person you admire by gifting this Glamorous Mens Birthday Hamper with Gift Voucher and sweep them off their feet. This Hamper arrives with CCD Voucher of Rs. 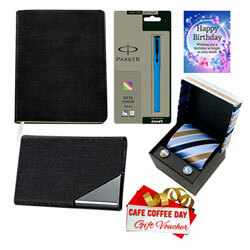 200, Parker Pen, Visiting Card Holder, Planner Dairy, Tie Cufflink Set and Birthday Card.